PSN and donors present over VND 10 billion to needy people under "Tet for needy people 2019"
PSNews - On the occasion of the Lunar New Year Festival (Tet), the Public Security Newspaper in collaboration with donors presented Tet gifts to needy people across the country, with the total value of VND 10 billion. 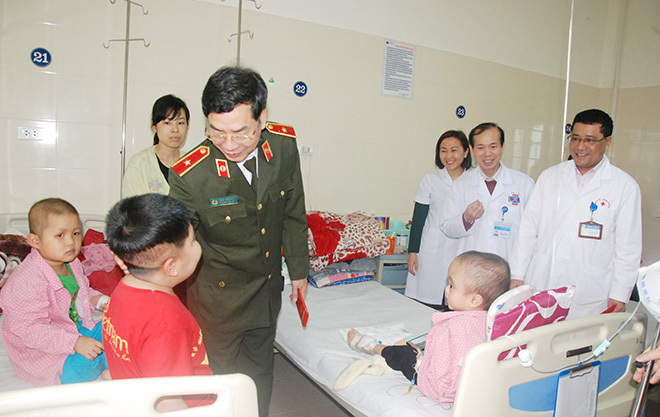 Major General Pham Van Mien, Editor in Chief of Public Security Newspaper visiting children at the Vietnam National Cancer Hospital. The Year of Pig marks the 20th anniversary of establishment of programme "Tet for needy people" of the Public Security Newspaper. This programme is a traditional and meaningful activity of officers; soldiers and friends of the Public Security Newspapers, helping needy people across the country enjoy a happy Tet. Mobilized by the Public Security Newspaper and with its humanitarian significance, the “Tet for needy people” has drawn the participation and donation from various traditional and new donors. On the occasion of the Lunar New Year Festival, the fund received about VND 10.5 billion in cash and gifts. With this fund, the Public Security Newspaper prepared and presented thousands of Tet gifts to needy people worth VND 500,000 each. The charitable mission of Public Security Newspaper visited needy people in remote areas from the North to the South such as Ha Giang, Cao Bang, Bac Can, Lang Son, Tay Nguyen, Binh Dinh, Can Tho, Ninh Thuan. A need person in Lang Son once said that: "Many thanks to the Public Security Newspaper for sharing difficulties and encouraging us. I'm very happy but I hope that the charitable mission will bring more happiness to other needy people in Vietnam. 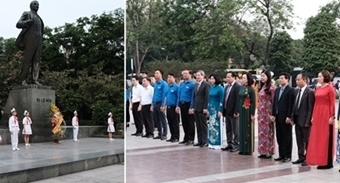 Additionally, the charitable mission of Public Security People also handed over gifts to children with serious diseases who are being treated in Hanoi; visited and presented gifts to people at the Center for Nourishing Elderly and Children with Disabilities in Hanoi and Ho Chi Minh City. The Public Security Newspaper hopes to continuously receive companions of enterprises and organization, individuals and benefactors to support the programme "Tet for needy people", contributing to helping and encouraging needy people to overcome difficulties in life.